Early Brayton Pottery dishes were a complete departure from what most people were used to when they debuted in the 1920s. They reflected the Arts & Crafts sensibility of the time but also came out of the Scandinavian folk lore tradition with their child-like simplicity and colorful palette of opaque glazes. “In view of its innovation and influence, Brayton Laguna Pottery ranks as one of the foremost companies in the history of Southern California pottery.” Thus began the Brayton chapter of my book, “Collector’s Encyclopedia of California Pottery,” that Collector Books released back in the 1990s. Its importance, in my estimation, has only increased over the intervening years. 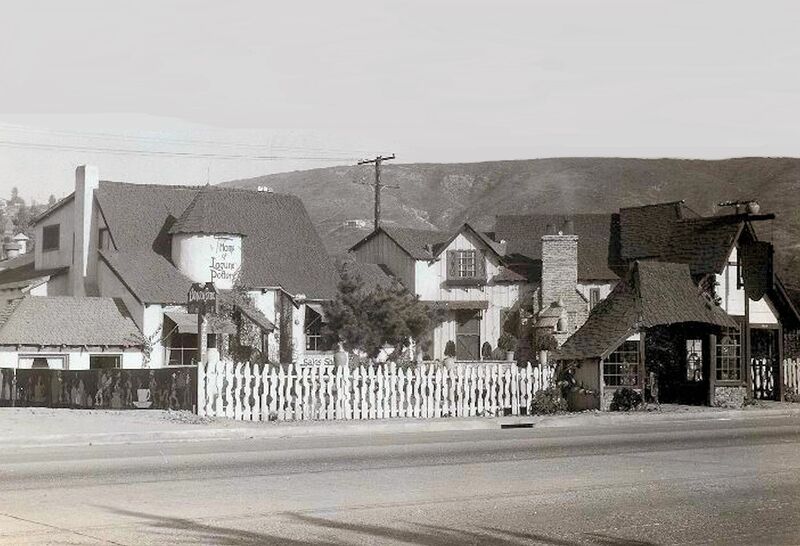 The business, originally known as the Laguna Pottery, was started by Durlin E. Brayton in the late 1920s. Durlin, of Swedish descent, was a California native and a graduate of Hollywood High School who also attended the Chicago Art Institute. He was assisted only by his wife in the early years as the business was a true cottage industry at first. Located strategically on the Coast Highway in Laguna Beach, the first products were simple earthenware dishes in a remarkable variety of solid colored glazes that included rose, strawberry pink, eggplant, jade green, lettuce green, old gold, lemon yellow, silky black and white. The ware that presaged California colored pottery had a casual handmade look and it didn’t take long before the seaside inhabitants of Laguna Beach discovered it. Other early products were hand-decorated plates, decorative tiles, vases and flowerpots. Brayton tiles adhered to the Craftsman ideal of hands-on authenticity and simplicity but, as with the dishes, the imagery had a folksy charm tempered by art world sophistication. 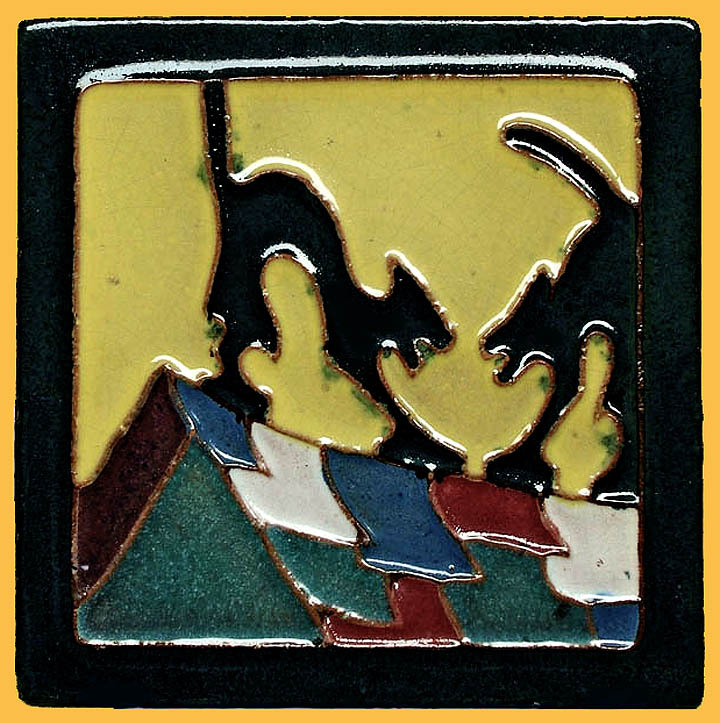 This 4 ½-inch Halloween-like scene of two black cats facing off on a rooftop was the work of founder Durlin Brayton, who was a Chicago Art Institute alumnus. This early (late 1920s-early 30s) 5 ½-inch vase has an unusual mix of glazes. Items such as this are not easy to find and remain highly valued by collectors. Durlin met and married his second wife, Ellen Webster Grieve, in 1936. “Webb,” as she was known, was also an artist, but with a head for business, and through her efforts the Laguna Pottery was transformed and became a successful and significant commercial enterprise. 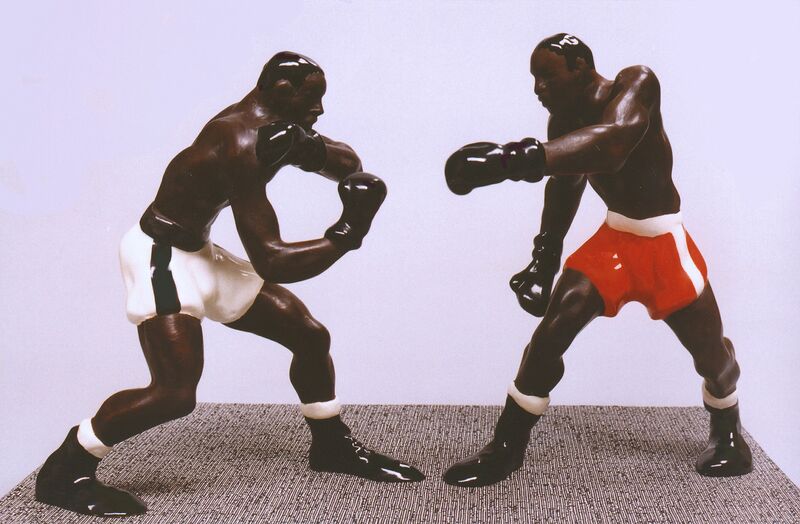 Mass-produced figurines were a staple product beginning in the late 1930s and continued to be big sellers for the company for many years. At first they were hand decorated by local artists. Laguna Beach has long been known as a haven for fine artists, so there was a large talent pool to draw from. The success of the figurines made it necessary to expand, and larger facilities were designed and constructed on a five-acre site at the corner of Coast Highway and Gleneyre in 1938. Due to the company’s reputation for quality figurines, it was the first pottery granted a license by Walt Disney to produce ceramic likenesses of his animated characters Mickey Mouse, Minnie Mouse, Donald Duck and Pluto. 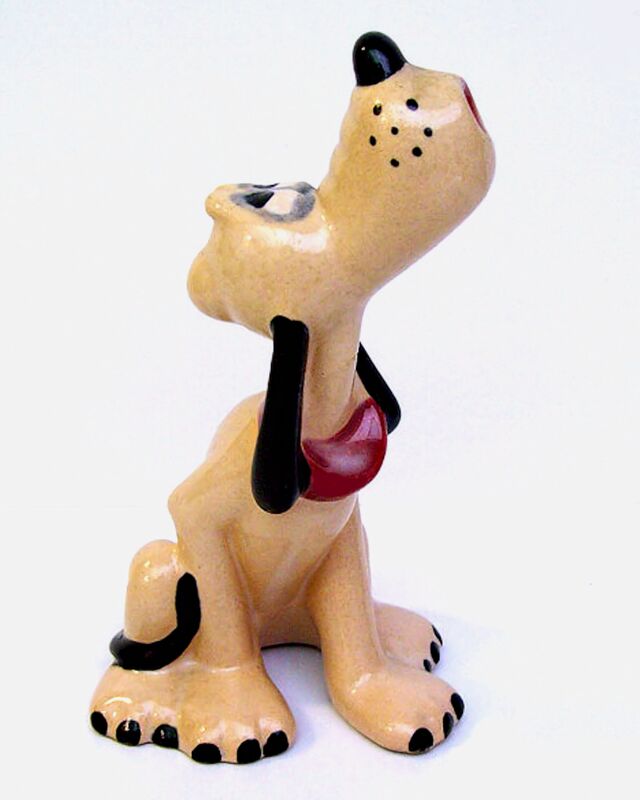 Also marketed from 1938 to 1940 were figures and animals from Disney’s first two full-length features—“Snow White” and “Pinocchio”—and the short subject “Ferdinand the Bull.” Following Brayton, the other California potteries that obtained Disney licenses were Vernon Kilns and Evan K. Shaw’s companies, American Pottery and Metlox. A postcard view of the expanded Brayton Laguna Pottery on Pacific Coast Highway in Laguna Beach. Some of the original Swedish style buildings still stand today. This is one of the two poses of Walt Disney’s Pluto that Brayton produced under license in the late 1930s. They were good sellers for the business and are not difficult to obtain today. 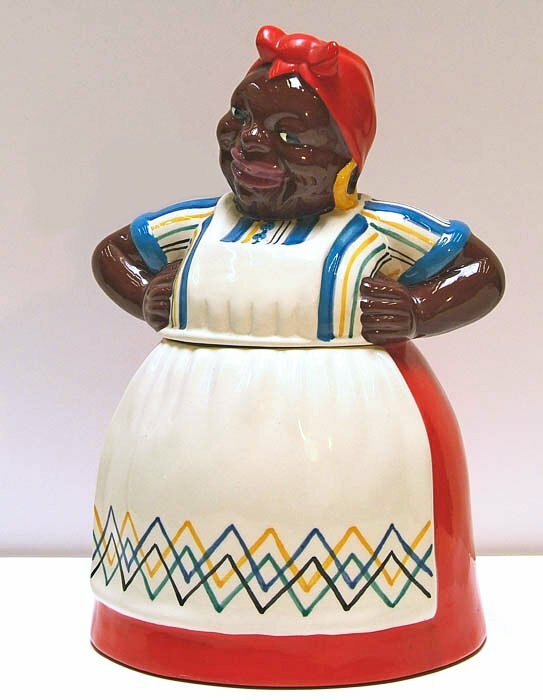 The Mammy cookie jar was popular in its day and remains a popular item with collectors of Black Memorabilia. It was made with a variety of decorations over an extended period beginning in the early 1940s. 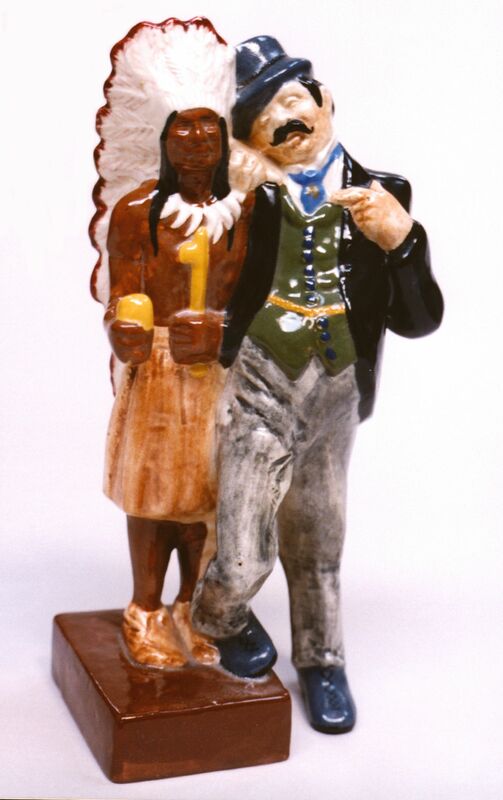 From the Gay Nineties series of figurines the 1940s, this 9 ½-inch man in period attire posing with a cigar store Indian is one of its harder-to-find items. Like other California potteries, the business grew tremendously during the Second World War, when ceramic imports were cut off from Europe and the Far East. The plant operated at capacity day and night with more than 150 workers employed on two shifts and more than 25 designers and modelers doing their best to keep up with the demand. Andy Anderson, Walter Bringhurst, Bill Dickenson, Jules Erbitt, Peter Ganine, Ferdinand Horvath, William Moore, Frances Robinson and last, but definitely not least, Carol Safholm were among them. Safholm, also of Swedish descent, designed and modeled some of the most outstanding figures and figure groups that Brayton produced. She was fascinated by the culture of Peru and Peruvian peasants were one of her favored subjects. During the war, the beach resort town hosted more than 65 new pottery businesses inspired by the success of Brayton and company. A cooperative organization known as the Laguna Beach Ceramic Society had to be established to help publicize the competing Laguna potters and foster good relations between them. After the war, the situation began to reverse as Japanese imports flooded into the country, many of which were cheaper copies of the home-grown product. Webb Brayton’s untimely death in the late 1940s was a serious loss for the company. After 1951 and the passing of founder Durlin Brayton, the spark was gone and the business began a long and gradual decline. In 1968, a truly unique and distinguished chapter in California’s ceramic history ended. 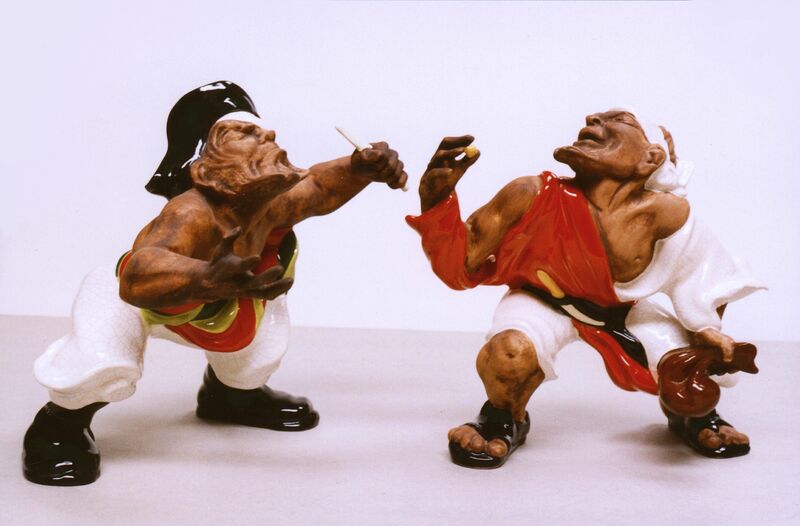 Carol Safholm designed and modeled this set of fighting pirates of the 1950s. 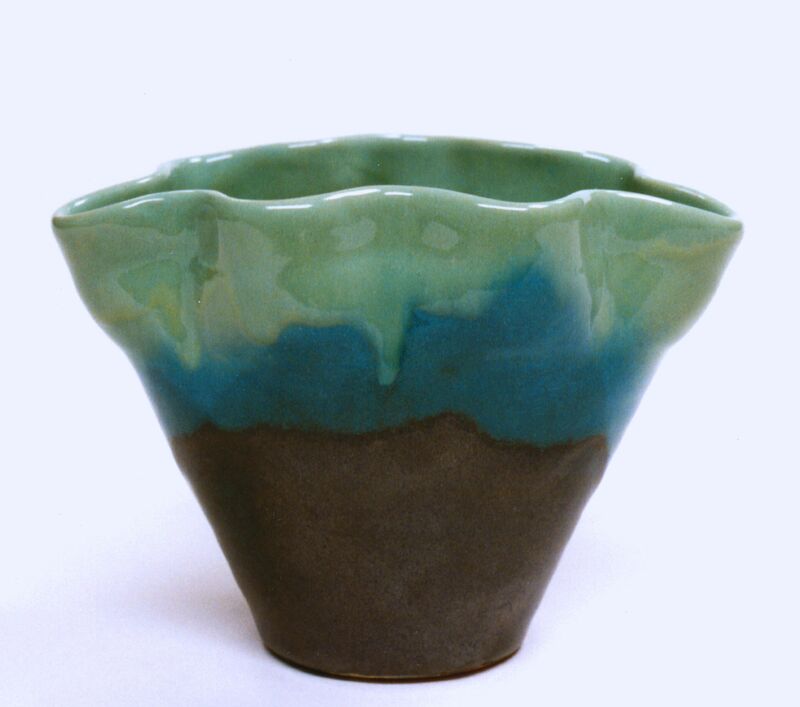 Large (9 inches in height) and not easy to find, they combine brown-stained unglazed areas with various colored glazes. Safholm was one of Brayton’s best designers. Her imposing set of black boxers was not a big seller in the 1950s and that, combined with their fragility, makes them rare and desirable today. This 17-inch somewhat Cubistic rooster of the 1950s was the work of designer Ferdinand Horvath, who got his start modeling Disney characters for Brayton in the late 1930s. He was adept at designing in traditional modes as well as modernism. 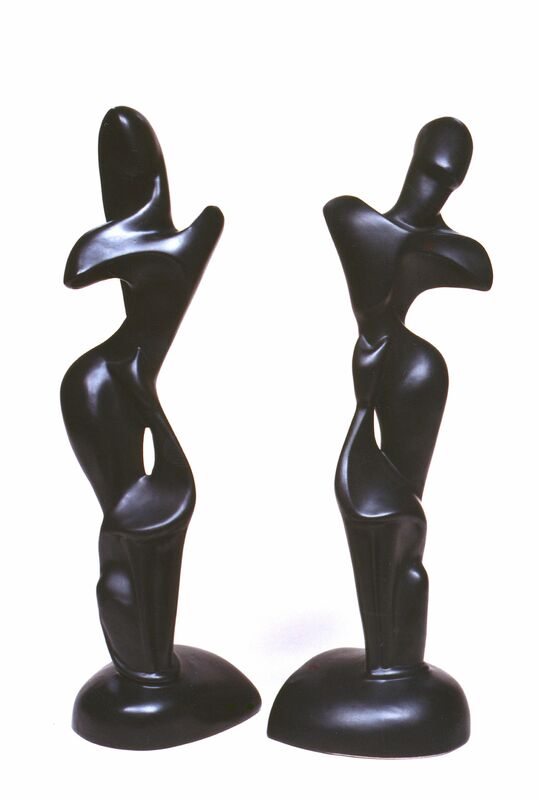 These black-glazed male & female abstract figures measure 21 inches in height. 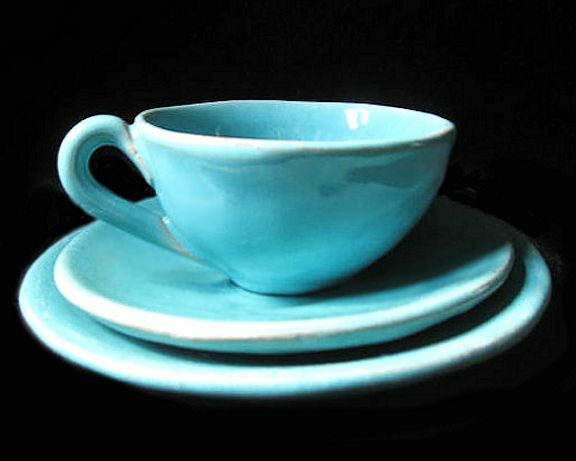 They are the work of Jean Yves Mock, a Brayton designer of the 1950s. 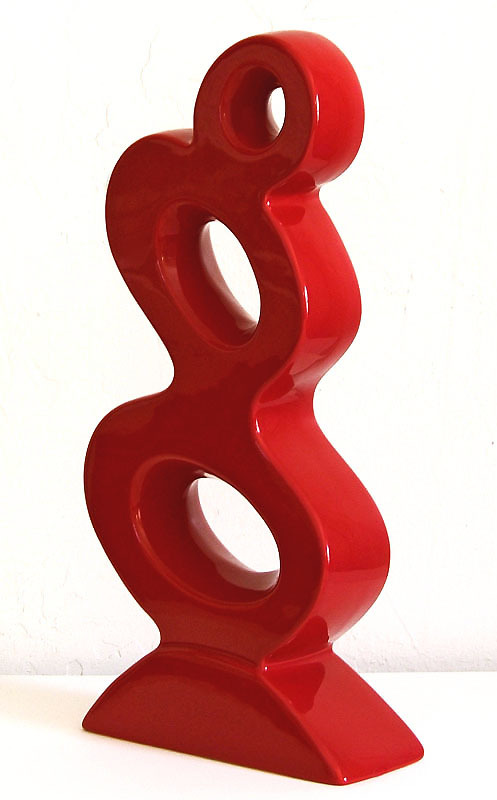 Ferdinand Horvath is believed to be the designer of this large abstract sculpture of the 1960s with an intense red glaze. 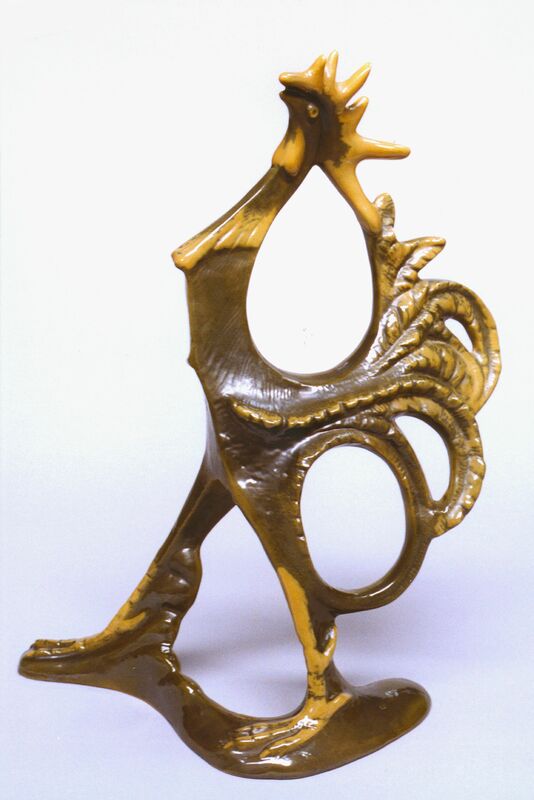 Sculptural items such as this are favored by collectors of Mid Century Modern Design. Happily, its legacy is being kept alive by many far-flung and dedicated Brayton Laguna collectors. Although values have plummeted for many items, there still is demand for certain things, such as the company’s early dinnerware and tiles, its beautifully hand-painted Disney figurines, and the modernist sculptures of the 1950s and ’60s. Brayton Laguna produced cast ceramic sculpture—animals, birds and human figures of moderate scale—that were usually marketed in sets of two or more. Various finishes were employed, “woodtone” being the most iconic. It was a textured and brown-stained bisque used alone or in combination with a white crackle glaze. Vases, planters, ashtrays, candle holders, cookie jars, salt and pepper shakers, and many other household and gift items rounded out the line during the California company’s 40 year history. Jack Chipman, an authority on California pottery and particularly Bauer pottery, has been collecting California ceramics for more than 25 years. His first book, “The Complete Collectors Guide to Bauer Pottery” (1982, co-authored with Judy Stangler). He also wrote “Collector’s Encyclopedia of California Pottery” (Collector Books, 1992 & 1999), Collector’s Encyclopedia of Bauer Pottery (Collector Books, 1997), “Barbara Willis: Classic California Modernism” (self-published, 2003) and “California Pottery Scrapbook” (Collector Books, 2005). Jack is also a fine artist, having graduated from the Chouinard/California Institute of the Arts; his work is in the collections of several museums as well as private collections. His email address is chipmanj1@gmail.com.